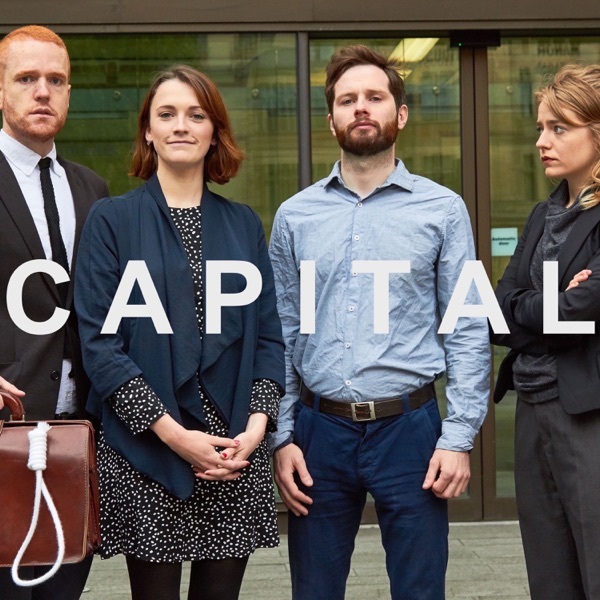 Recap the first three episodes of acclaimed podcast 'Capital', the improvised sitcom all about the civil servants dealing with the fallout of a referendum that brings back capital punishment with a 51% majority. New episodes begin with Episode 4 on Monday 11 December. Meet the civil servants dealing with the fallout of a referendum that brings back capital punishment with a 51% majority. This week, in the final episode, it's the day of the hanging. Featuring guest star Emily Lloyd-Saini. Meet the civil servants dealing with the fallout of a referendum that brings back capital punishment with a 51% majority. This week, the team must meet the human rights of capital punishment's first victim. Featuring guest stars Harry Enfield, Emily Lloyd-Saini, Alastair Roberts and Katy Wix. Meet the civil servants dealing with the fallout of a referendum that brings back capital punishment with a 51% majority. This week, the team go to America. Featuring guest stars Harry Enfield and Alastair Roberts. Meet the civil servants dealing with the fallout of a referendum that brings back capital punishment with a 51% majority. This week, the team decide the executioner. Featuring guest stars Flora Anderson, Celeste Dring, David Elms and Cam Spence. Capital will return in Autumn. Meet the civil servants dealing with the fallout of a referendum that brings back capital punishment with a 51% majority. This week, the team decide the first victim of execution. Featuring guest star Rosa Robson. Meet the civil servants dealing with the fallout of a referendum that brings back capital punishment with a 51% majority. This week, the team decide the method of execution. Featuring guest stars Harry Enfield and Jon Snow.